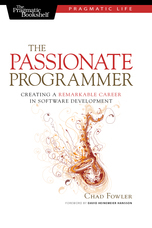 If you’re looking for an inspiring software development book with practical advice on how to become not only a better programmer, but a better employee, communicator, and overall balanced person, I highly recommend The Passionate Programmer by Chad Fowler. As software developers, we have the unending pressure and desire to continually improve our craft, to stay ahead of the curve, and not become obsolete in an ever changing industry. Chad offers useful tips on how to improve personal productivity within one’s current place of employment, expand industry knowledge and confidence by contributing to open source software, and brand oneself by becoming a helpful member of the software development industry as a whole. Self evaluation and incremental, daily goals empower the developer to achieve these tasks. Even those of us with an already busy schedule can daily implement small drops of Chad’s advice to the bucket of our career which will help keep each of us relevant and useful in the software development industry. Each chapter is short and the book is laid out in such a way to make it difficult to put down. Perhaps the first non-fiction book that kept me up late reading for a few nights, I found each of the 53 tips relevant. And each chapter/tip is followed by a call to action with very do-able suggestions to help you implement the tip. Well worth the read and I’m already am attempting to put Chad’s advice to practice! If you need an html, xml, etc… parser for your latest Rails application, nokogiri may be the tool for you. Allow me to introduce a real life example for which I found it quite useful.